The morning after the incredible day before, Winx’s trainer Chris Waller was typically very emotional as he tried to process not just the final, brilliant instalment of the great horse’s career, but the whole incredible ride they had been on together. Standing in the middle of the parade ring at Rosehill at 8am on Sunday, taking questions from the media as Winx walked circles in the background guided by her chief handler Umut Odemislioglu, Waller said the enormity of what had happened at Randwick on Saturday was yet to sink in. Asked if he had managed to get a moment to himself on Saturday night, during celebrations to mark Winx’s win in her farewell race - the Longines Queen Elizabeth Stakes – Waller replied: “Not really. It hasn’t really sunk in yet – yesterday, let alone what she’s done to me (with her overall career). It’s very much a team thing at the Waller stable. Everyone who works there, whether they’ve been directly involved with Winx all along or had just a fleeting association, will get their chance to say goodbye. Waller’s own individual achievement on Saturday, in winning three Group Ones in three straight races (Verry Elleegant in the Heineken 3 Australian Oaks and Shraaoh in the Schweppes Sydney Cup bookended Winx’s success) was obviously amazing in itself. It took him from 98 Group Ones as a trainer to 101, with Winx’s win poetically being the 100th, and would’ve been a huge story normally, but he wasn’t in the least bothered that the wonder mare’s 33rd straight win to complete her career still dominated the spotlight ahead of his own milestone. “Rightly so,” Waller said. “Winx has been a big part of my career and it was all about Winx yesterday and for the right reasons. "It was pretty obvious it was a big sporting moment and one that generations will keep in their mind for a long time and pass on to children and grand-children. Waller prefers not to get involved in the debate over whether Winx is the greatest horse ever. He feels it’s too hard and ultimately unfair to compare the great champions from different eras. He’s happy saying Winx is “right up there as one of the best”. 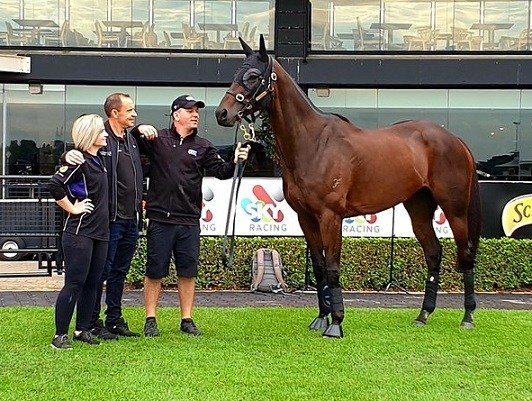 It’s going to be hard for everyone at the Waller stable to let Winx go for good, but it is a reality that will occur within days as she heads off for a well-earned rest and eventually the breeding barn. “We haven’t discussed it yet (when she’ll leave),” Waller said. Waller will no doubt share a quiet moment alone with Winx before she goes. He got very emotional when he talked about having done that “occasionally” in the past. And what would he say to her in a quiet moment now, if he thought she could take it in? “Just thanks for everything, as anybody would,” he said.